I spent this weekend with my mom and my sister. It was a much-needed weekend with family, and we spent a lot of time exercising, relaxing, and eating well. In July, my parents sold their house and moved to Singer Island in Florida. They’ve been coming down here for years during the winters (they bought a condo years ago) and they finally decided to take the plunge and move here full-time. While my father still flies up every couple of weeks for work, they’ve really settled into Florida life well. And after a weekend, I understand why! Living in a place that’s warm year-round really lends itself to being healthy. 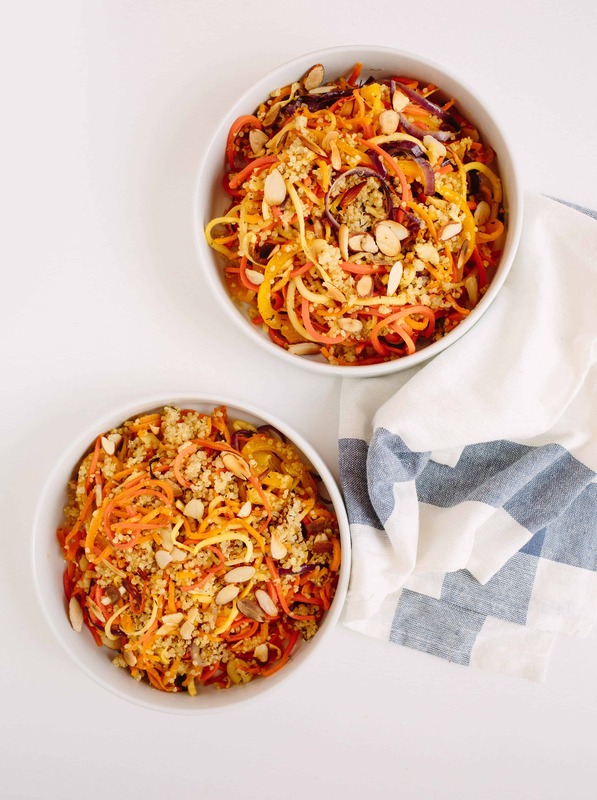 There’s no “it’s so cold out, all I want is mac and cheese!” Instead, you want refreshing salads, crunchy sandwiches, and lots of water and iced tea. You’re more motivated to go outside and do things! Every day we were here, we worked out and had a healthy lunch. We went to this place Christopher’s Kitchen in Palm Beach Gardens twice for vegan lunches and it re-affirmed my love of vegan food – it’s just so nourishing, filling, and makes you glow from the inside out. It was a much-needed weekend, I feel rejuvenated (thanks to the exercise, sun rays, and healthy eats), and I’m happy to be going home and continuing the healthy stride at home. 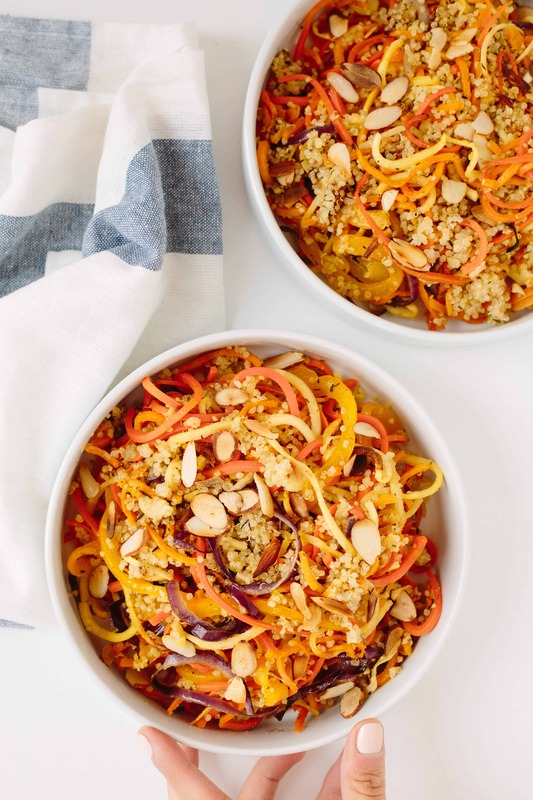 This recipe is one I’m going to be making on repeat all fall and winter – it’s easy (just toss together roasted spiralized veggies with quinoa!) and saves well in the refrigerator. 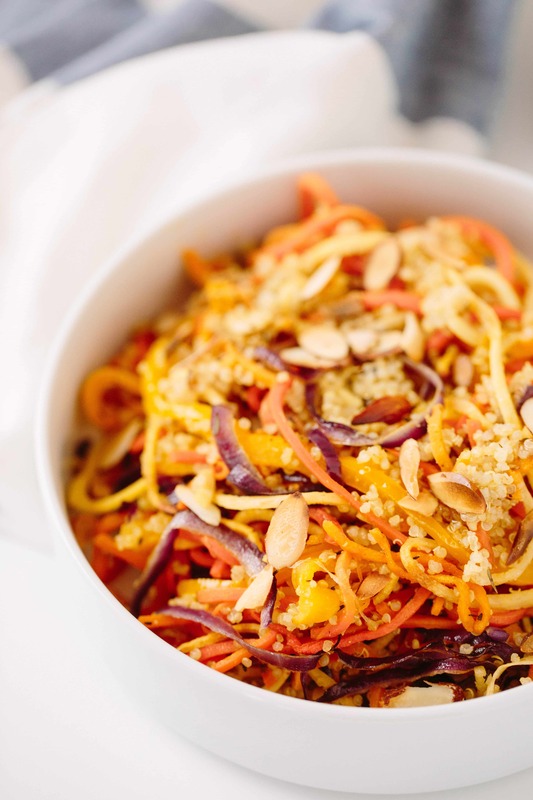 This dish is filling, flavorful, protein-packed, and colorful. It would go well with some goat cheese, too – it’s definitely a versatile dish. However you decide to enjoy this, I hope it makes your weekly dinner routine! Place the quinoa and water in a medium pot and bring to a boil. Once boiling, cover, reduce heat to medium low and simmer until water absorbs, about 15 minutes. Add water if needed as the quinoa cooks. Fluff up with a fork when done. Meanwhile, place all of the spiralized veggies on the baking sheet and add the olive oil, salt, pepper, garlic powder, and thyme. Toss together to combine well. Spread the seasoned veggies out on the baking sheet and roast in the oven for 20-25 minutes or until softened. Halfway through, toss the vegetables. While veggies roast and quinoa cooks, place a small skillet over medium-high heat. Once pan is hot, add the sliced almonds and toast for 5 minutes or until fragrant and lightly browned. Set aside in a bowl or plate. Maybe one day! It's definitely hard having my parents down there and so far away! So glad you like the recipe! I'm seriously bummed I still cannot source big enough carrots. But this recipe looks great!! What a bummer! Sorry to hear that! Try golden beets, butternut squash or sweet potatoes instead! Am I reading correctly that the fat gram content is 57? That is way over my 33 gram per day goal. The fat comes from the almonds and olive oil! It looks like the nutrition facts (at least the fat content) might have been the total amount for 4 servings, rather than 1? Made this dish last night, it was fabulous! Is this really supposed to be one serving for the entire recipe? The 3 cups cooked quinoa alone would leave me stuffed, even without the veggies! I tried to roast my yummy sweet potato fries in my power air fryer on 400 for 15 minutes like a nice beet & sweet potatoes salad recipe said and I burnt to a crisp my wonderful yummy noodles??? Suggestions for air fryer or Nuwave fries??? Also just firm consistency sweet potato noodles?? thank you for more vegan recipes! I feel like I hit a jackpot! I'm going to a family gathering for Easter and have been asked to bring a few vegan dishes. Would you happen to have any suggestions for some that are easy to transport? Actually when someone doesn't understand aftesr that its up to other visitors that they will help, so here it takes place. Adding a little goat cheese took this dish from a tasty, healthy side dish to the next level. Craveable and delicious!